When children and Play-Doh co-exist in a carpeted room, some of the doughy substance is bound to find its way into the carpeting. You may be able to remove some of the dough while it's still soft, but waiting until the rest dries allows you to remove a majority of the substance without spreading it farther or deeper into the carpet. Pick up large or loose pieces of Play-Doh from the carpet by hand. 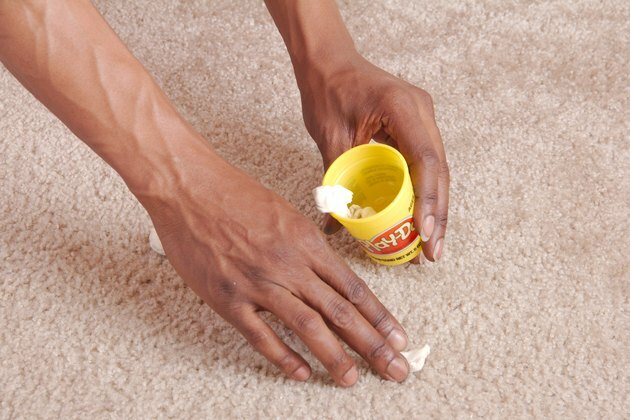 If the remaining substance trapped in the carpet is still soft, dab at it with a ball of pliable Play-Doh -- ideally a white piece so it leaves no color behind. Separate the carpet fibers slightly with your hands to reach bits of deep-down Play-Doh. The soft substance will also pick up bits of dried dough, dust and lint. Wait until the Play-Doh dries completely to remove any stubborn bits, keeping pets and children away from the area in the meantime. If the Play-Doh has already hardened, rub your hand back and forth over the carpet in the affected area to loosen the dough's grip on the carpet fibers. Pick up dried chunks and crumbs as you find them, depositing them immediately in a trash can. Rub a clean, dry nylon-bristled scrub brush firmly over the carpeted area if unable to loosen all the Play-Doh with just your hands, or scrape the fibers with the edge of the bowl of a plastic spoon. Vacuum the carpet; then run your hand over the area again to feel for more dried Play-Doh. Repeat the rubbing, dry scrubbing and vacuuming until you've removed as much as possible. If a little of the dough's color remains after you've removed the Play-Doh from the carpet, dab the spot gently with a white cloth dipped into mildly soapy, cool water. 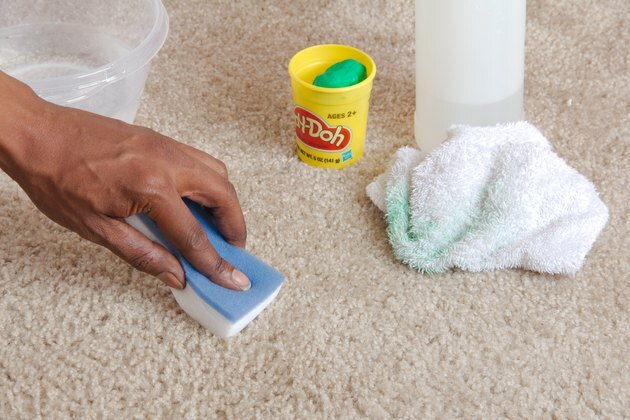 A liquid dish soap is gentle enough to clean the carpet without causing discoloration; if unsure, test the soapy water on an inconspicuous area first. Keep the cloth damp, rather than soaking wet, to prevent excess moisture. Rinse the cloth; then dab it again to remove remaining soap. Pat the area dry with a fresh white cloth. 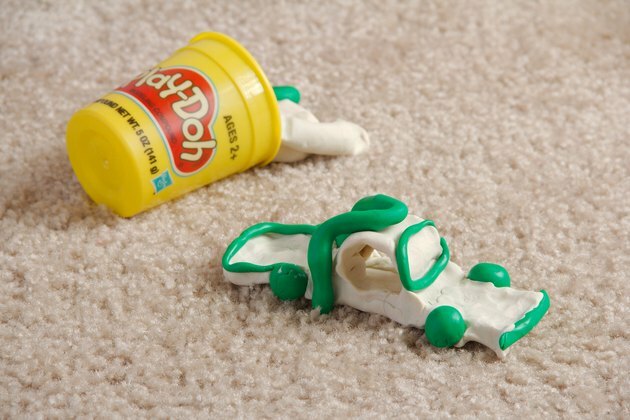 If colorful evidence of the Play-Doh remains even after you apply soapy water to the carpet, blot the spot with a bit of rubbing alcohol on a clean white cloth. Keep the cloth damp, rather than sopping wet, to prevent soaking through to the carpet padding. Check the towel frequently to see if it has absorbed any of the color; if so, dab the carpet again with a fresh area of the towel. Rinse the area afterwards by wiping it with a damp white cloth. Diluted white vinegar may also remove any remaining stains. Mix one part vinegar with four parts cool water; then dip a white cloth into the mixture, wringing out excess moisture. Dab and blot the spot, as with the alcohol. Test both alcohol and vinegar in an inconspicuous area of the carpet before applying either to the stain.